The fourth DCS issue “Making and Hacking” sheds light on the communities and spaces of hackers, makers, DIY enthusiasts, and ‘fabbers’. 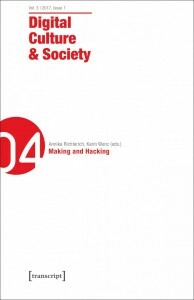 Academics, artists, and hackerspace members examine the meanings and entanglements of maker and hacker cultures – from conceptual, methodological as well as empirical perspectives. With contributions by Kat Braybrooke and Tim Jordan, Sabine Hielscher, Jeremy Hunsinger, Justin Marshall and Catharine Rossi, among others, and an interview with Sebastian Kubitschko.